Some wise buys for the smart ST shopper. Arthur Leyenberger is a human factors psychologist and free-lance writer living in New Jersey. He has been an Atari enthusiast for over five years. When not computing he enjoys playing with robotic toys. The new year is now upon us and with the new year comes the prospect of exciting developments for Atari ST owners. If you've read the last two episodes of "ST user" you know that each successive year brings a slew of new products for the Atari ST owner. This year, we hope, will be no different from years past. In this Buyer's Guide we will take a look at the bountiful harvest of recently introduced products for the Atari ST, and reexamine the bevy of solid performers from previous years. As is our policy—stated up front for all to see—we make no claims that this list of products is comprehensive. There are so many good products out there, that we cannot possibly include them all. Further, we may overlook your particular favorite piece of hardware or program. If you think we missed the boat let us know. Sometimes there are products that escape even our ever-watchful eyes. On the other hand, what we do promise is a sincere effort to pick and describe the "best of the best" of ST products. If it's mentioned here, you know it's good. So, with caveats emptied, forewarnings forewarned and word processors at the ready, we present to you the 1988 ST-Log Buyer's Guide. For me, the best backup program for the ST is still Copy II ST by Central Point Software. They continue to update the program at least twice a year and the company has the experience of making this kind of product for several types of microcomputers. Copy II ST works with one or two disk drives, either single- or double-sided. It provides a fast sector copier and a bit copy utility for making duplicate disks. The program is completely mouse-driven, so it's easy to use and retails for $40. Copy II ST is intended only for making archival copies of disks for your own use. Migraph, the makers of Easy Draw, have a useful utility program called Label Master Elite. It's a GEM-based label maker and mailing list program that retails for $40. Labels can be printed with, or without, designs in a variety of formats, including mailing labels, 3½-inch disk labels, and 3×5 and 4×6 index cards. The program comes with 100 graphic designs and the graphics editor lets you create your own designs, cut and paste between designs, or use Printmaster designs. The mailing list manager allows you to search, sort, delete and modify records, merge databases and create freestyle labels. It also has a 48-character comment field. Other features of Label Master Elite include the ability to work with most printers—including 9- and 24-pin printers—and the power to print directories and disk labels. There are several useful utility programs for ST users who own hard disk drives. Beckemeyer Development Tools has supported the ST from almost the beginning. Their first ST product was Micro C-Shell, a UNIX-like command line interpreter which not only was a boon to program developers and end users alike, but also showed us Beckemeyer's ability to create and support quality system software. The Hard Disk Toolkit from Beckemeyer is a program that provides fast and reliable hard disk backup, plus verify and restore operations. The backup program automatically formats the disk as it copies and the user can choose to backup any file, folder or an entire disk. Hard Disk Toolkit retails for $30. Another excellent Beckemeyer product is The Hard Disk Accelerator, a software package that makes the ST perform faster by speeding up the hard disk access. Common tasks, like starting a program or searching a database, can often increase in speed by 100 to 300 percent. The Hard Disk Accelerator is a "disk-caching" program, which means that it keeps a part of the program that's normally stored on the hard disk in memory. The net result is a reduction in the number of disk accesses. Hence, fewer accesses means faster speed. The Hard Disk Accelerator works with programs of all sizes, and can be easily configured to use as much or as little RAM as you want. The program is not copy protected and lists for $40. Eidersoft is a British company that recently started marketing ST programs in the U.S. So far, their products are topnotch. One particularly useful pair of products is Flash-Bak and Flash-Cache. These two programs are packaged together and provide hard disk backup and disk-caching functions. 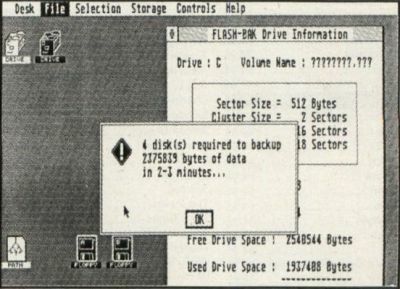 From my preliminary tests, Flash-Bak is the fastest hard disk backup program for the ST. The program is GEM-based, can use two floppy drives alternately for backup, and also allows the user complete control over all aspects of operation, such as verification, encryption, data compression, etc. Moreover, Flash-Bak is able to selectively backup files based on criteria selected by the user (i.e., date stamp, wild card match, etc.). Flash-Cache is the RAM cache utility that holds a part of the most recently accessed part of the hard disk in RAM. This has the practical effect of speeding up disk-intensive operations such as program loading/saving, program compilation and data manipulation. Caches can be any size to suit your system. One very important extra function in Flash-Cache is that it allows the "folder heap" (number of folder accesses) to be enlarged, thereby avoiding the infamous Atari TOS "40-folder syndrome." Flash-Bak and Flash-Cache retail for $80 and they are well worth the price for owners of hard disk drives. Tempus, another product from Eider-soft, is a GEM-based text editor for programmers. It offers just about every feature you would expect in a top-of-the-line product, plus a few more. The most outstanding feature of this product is its speed—which happens to be blindingly fast. 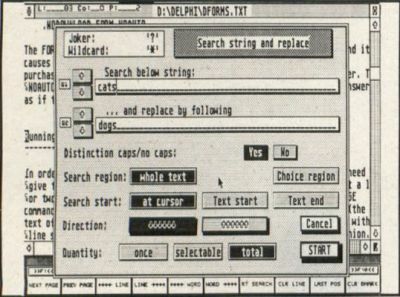 Compared to a word processor like 1st Word, Tempus is four to ten times faster in loading files, scrolling the document from top to bottom and searching and replacing on a single character. Compared to a text editor like MicroEMACS, Tempus is up to five times faster for the same operations. Other features of Tempus include medium- and high-resolution support, mouse or keyboard operation, the ability to have up to four files on-screen at once, auto indentation for structured programming, on-line help menus, twenty programmable function keys, and more. A particularly useful feature for programmers is the editor's ability to automatically create a cross reference list, with line and column references, to multiple search strings. Once the search string is specified, the table is created very fast, then subsequent clicks on the right mouse button instantly moves the cursor to the next string match in the document. Tempus retails for $50 and is by far the best ST text editor currently available. MichTron is another of the handful of companies that have supported the ST from the start. One of their titles is a multiple desk accessory called Cornerman. Cornerman offers the user ten separate functions under one accessory name, including: a complete ASCII reference table, with decimal, hexadecimal, character and mnemonic information for all 256 ASCII codes; a 16-digit calculator containing binary, octal, decimal and hex modes, three summing memories and printing tape display; a notepad with full editing, word wrap and automatic date and time stamp; a phone dialer with autodial capability; a phone log that will automatically transfer information from the dialer; a fifteen-puzzle game; two clocks—one is digital, the other analog; a complete setup module for customizing dialer, RS-232, clock, calculator and window position parameters; a print utility; and a DOS window to be used with MichTron's DOS Shell. All of these features for a list price of just $50. Another useful utility program is Write 90 from XLent Software. This program's primary function in life is to print text and VIP spreadsheet files sideways. Write 90 offers five different character sizes, onscreen preview of sideways printed files, the ability to use continuous or single-sheet paper, and supports printers such as Epson, NEC and others. Write 90 lists for $30. It's difficult to describe the most revolutionary product for the ST in just a couple of paragraphs. Suffice it to say that PC Ditto from Avant-Garde Systems allows you to turn your ST into a PC clone. Why in the world would anyone want to do that? If you use a PC at work and have an ST at home, PC Ditto allows you to run hundreds of PC software packages on your ST. No kidding! First, you need to have an RGB monitor since Ditto does not yet support monochrome. Second, it really helps to have a 5¼-inch external disk drive for your ST (Paradox and IB Systems are two companies that make them), because almost all PC software is sold on this size disk. Aside from these two points, the program works quite well and is fairly simple to use. Of course, the PC programs don't run as fast on the ST as they do on a PC, but for most programs, it really doesn't matter. PC Ditto sells for $90. There are three ST word processors that are, at this time, worthy of your consideration. 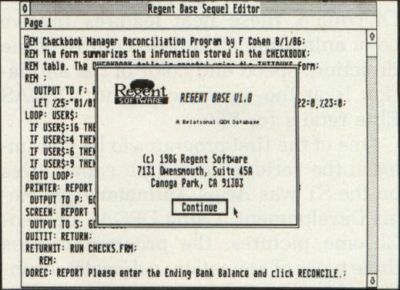 One of them is Regent Software's Regent Word II. Regent Word II is a full GEM-based implementation of their previous word processing program, Regent Word. Moreover, many new features have been added and the program runs faster. 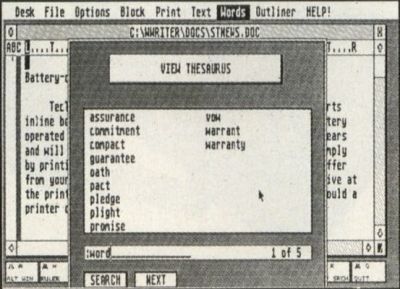 Space does not permit a listing of all of the program's features, but they include a built-in spelling checker, a multiple margin command that lets you easily create indents and outdents, word count, a foolproof and easy to use block command, and the ability to design and use up to nine fonts. Regent Word II has some additional features that make life in the "write lane" easy, including automatic reformatting, on-screen display of line and page numbers, and a brief—but thorough—manual. Regent Word II sells for $80. Another excellent word processing program for the ST is Word Writer by Timeworks. By the looks of the packaging, one unfamiliar with the software might judge this to be a top drawer program. Indeed it is. The quality is apparent in the operation of the program, as well as in the documentation accompanying it. Word Writer is a full-featured, GEM-based word processor that includes an integrated outline processor, three spelling checkers, extensive help screens and a built-in print spooler. Other features include on-screen display of text attributes such as underlining, boldface, italics and super/subscripting. In addition to being a stand-alone word processor, Word Writer interfaces with other Timeworks products such as their database program, Data Manager, and spreadsheet, SwiftCalc. Text files from 1st Word can be imported and printer drivers are provided for a variety of printers. Word Writer ST retails for $90. Abacus not only excels in the technical ST book category—they're clearly the most prolific publisher—but they also have a very good word processor. Text Pro is a GEM-based word processor with all the mouse-driven features most of us have come to know. However, once you learn the program, you can use keyboard commands, instead of mousing around. In addition to having almost all of the required features of a good word processor, Text Pro has a few additional ones as well. Like several other Abacus products, Text Pro was originally written by Data Becker, a German software publishing company. The program is a second generation word processor for the Atari ST. It can print two-line headers and footers, display output on the screen, easily print multiple-column text and perform logical hyphenation, making it one of the best ST programs currently available. In addition, such features as sorting, indexing and table of contents make Text Pro worthy of your attention when choosing a word processor. Text Pro retails for $50. If you do any kind of writing at all you'll want to use a spelling checker. Two of the word processors mentioned above include spelling checkers, but for my money, the best one is still Thunder!. Originally published by Batteries Included, Thunder!—like all BI products—is now published by Electronic Arts. What makes it the best spelling checker for the ST? Features, features and more features. Thunder! comes with two versions of the spelling checker program. One is a desktop accessory program that can be used anytime from within a GEM program and really contains three programs in one: a 50,000-word, real-time spelling checker; a word expander/corrector; and a set of writing analysis tools. The other, a word expansion feature, lets you predefine how specific strings of characters should be expanded. You can, for example, define your initials to stand for your entire name. Then, whenever you type your initials, your full name will appear. The writing analysis tools consist of standardized measurement statistics that rate the "readability" of your prose. They include two readability indexes that measure the grade level you write at, and the number of characters, syllables, words, sentences and paragraphs in your document. Thunder! 's spelling checker lets you add your own words—a must for any quality spelling checker. Separate dictionaries can be set up to speed up the already-fast checking function. One particularly useful feature of the desktop accessory is that once it's loaded, you can "turn it off," thereby freeing up the RAM for other programs. Most other accessories require you to reboot to rid them from memory. The other version of Thunder! 's spelling checker is a stand-alone program that can be used with any file. It lets you check files created by non-GEM programs, as well as any using GEM. Thunder! retails for $50. Desktop publishing is a combination of word processing, page layout and drawing that lets you design, compose and paste up the contents of a printed page for forms, newsletters, charts, etc. Publishing Partner by SoftLogik Corp. is the best desktop publishing program available for the ST. With it, you can create a document of up to 99 pages on a 1040ST and about 27 pages on a 520ST. Type can be as small as 6 points, or as large as 144 points, in half-point increments. Multiple columns are easily created and text can be entered directly, or imported from an ASCII file. Text can be routed from column to column, or page to page, and a large variety of text attributes can be used. Output can go to Epson, Apple LaserWriter, Postscript or a GDOS supported printer. Publishing Partner is a full GEM application. Drop-down menus make learning and using the program simple; but, the power of the program is far from simple. You can load any Neo-Chrome or DEGAS pictures and enlarge or reduce them for exact fit. Several drawing tools—circles, boxes, lines, etc.—can be used from within the program. Different line types and line widths can be specified, and any of forty-eight different fill patterns can be used. Publishing Partner sells for $150. An impressive program, it combines the features of a drawing, word processing, graphics and publishing program into one complete package. Other programs claiming to be desktop publishing programs pale in comparison. If you need a little something more than a paint program, something that offers a greater degree of precision, you should consider Migraph's Easy Draw. Billed as a professional drawing program for the ST, Easy Draw is an object-oriented program that lets you create custom business graphics, presentation materials, multidimensional illustrations and line drawings. The program offers eleven drawing tools and thirty-nine patterns to help create anything from technical drawings to simple illustrations. Drawing is easy with features like multiple windows, full GEM interface with drop-down menus and mouse action, zooming, clipboard art, pre-defined patterns, object rotation and multiple font selection. Easy Draw sells for $80. EZ-Calc from Computer Palace is a good spreadsheet program that lists for $70. Since it's GEM-based, it uses the mouse for all commands. It requires less memory than other similar programs, so there's more room for your formulas and data. Features include: a 300-column by 999-row maximum worksheet matrix, a built-in ten-key calculator, on-line help windows, a built-in sort routine, the ability to have up to ten function key macros, a split-screen capability, a notepad and graphing. The graphing is especially nice because it can be performed immediately from the worksheet, by selecting a drop-down menu command. EZ-Calc is quite easy to use and compares favorably to other ST spreadsheet programs. SwiftCalc is Timeworks's spreadsheet program that can be used by itself or interfaced with their Data Manager ST and Word Writer ST products. SwiftCalc features include: a maximum worksheet size of 8200 rows and 256 columns; the ability to print the spreadsheet normally or sideways; a selection of graphic formats (pie charts, vertical bar charts, scatter diagrams and line diagrams); built-in mathematical and financial functions; and full support of the GEM interface. In addition, on-line help and sample spreadsheets are provided. Couple these features with excellent documentation and you have SwiftCalc, which retails for $80. Timeworks's database program, Data Manager ST, also interfaces with the other two Timeworks products (word processor and spreadsheet). Data Manager is a GEM-based application program that comes with sample databases that illustrate mailing lists, sales analysis and other types of databases. The program also features extensive on-line help screens, a print spooler, report writing capabilities, full math capability, and graphics and label-making functions. Data Manager ST retails for $80. One of the most popular ST database programs is Regent Base, a GEM-based product from Regent Software. This popularity is due, no doubt, to the program's dual identity: it's both an easy-to-use, mouse-driven database program and a feature-laden relational database program/language. The advantages of a database programming language are power and flexibility. You can design your database, reports, functions, printing routines and applications exactly as you want them. GEM input and output boxes, titles, mouse-controlled buttons and other screen parts normally associated with a database program are easy to create. Regent Base sells for $100. Another valuable program is Electronic Arts’ Financial Cookbook. For $40, this program includes dozens of financial "recipes" for calculating everything from mortgages to IRAs. It's been around for years, but I still recommend it highly. DEGAS is one of the best values in ST graphics software. It was the first full-function ST paint program and one of those products that every ST owner should buy. DEGAS lets you paint in any of the three ST graphics modes and save your files to disk. In fact, the file format used by DEGAS has become an ST standard. DEGAS is now distributed by Electronic Arts and retails for $40, although most stores sell it for under $30. Soon after DEGAS was complete, author Tom Hudson began thinking about future features for the program. The result, DEGAS Elite, is also distributed by Electronic Arts. DEGAS Elite contains all the functions of the original program, plus major enhancements and additional features that make it, in my opinion, the best graphics paint program available for the ST. 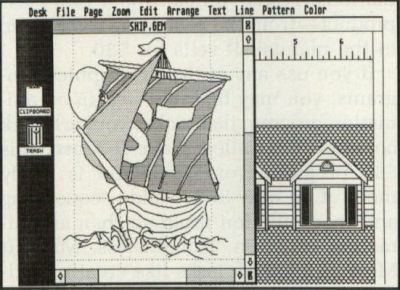 Some of the features of DEGAS Elite include: use of eight multiple work screens; the ability to cut and paste all or part of these screens to each other or to disk; the ability to create and use clip art; block operations such as stretch, rotate, horizontal or vertical skewing and distortion. Of course, these neat features involve color animation. Complete control of the direction, speed and color of the animation is at the user's command. DEGAS Elite retails for $80. One of the first programs to let you unleash the serious animation capabilities on the ST was Aegis Animator from Aegis Development. Using DEGAS or Neo-Chrome pictures, the program creates three types of animation: eel, metamorphic and cyclic. Cel animation moves bitmapped images as a unit. Once cels are clipped and saved, placed on the screen, sequenced and given a duration, the resulting illusion of movement looks quite real. Metamorphic animation involves creating an image and specifying the changes it will take on. As the picture goes from one image to another and back, the illusion of movement is created. Color cycling creates movement by rotating colors (like DEGAS Elite and Neo-Chrome). These techniques may be used individually or together to build professional quality animations. Aegis Animator is a first-class product—from the packaging right down to the manual. It sells for $80. If you use any of the ST graphics programs, you may be interested in an animation program that makes your art work come to life. Called Make It Move, this $50 program from MichTron is really more of an easy-to-use slide sequencing and manipulation program than an animation program. Nonetheless, Make It Move is great for tasks like creating video titles, making presentations, and putting some polish on your collection of ST graphic images. The program is mouse-driven and doesn't require any special programming skills. Features include screen wipes in any of four directions, fades and quick cuts, each with user specified durations. Objects may be zoomed, panned, hidden and moved. Printmaster Plus from Unison World is a graphics program that allows the user to be creative. With it, you can easily create calendars, flyers, stationery, banners, invitations, signs and greeting cards with many types of printers. The program is menu-based, allowing you to preview your design before printing it. You can also save your graphics to disk. In addition, Printmaster Plus has been totally redesigned to give better graphic output and work with add-on font and graphic disks. Printmaster Plus lists for $40. —Flight Simulator II from subLOGIC has been around for several years in 8-bit format. Now that the program is available for the ST, users will benefit from an improved visual display with much better graphics (as it should be on the ST), a better control interface for flying the plane from either the keyboard or the mouse, and the ability to get in the air faster with less frustration. Although you may not be a Top Gun, Flight Simulator II is, and it can be bought for $50. Electronic Arts is a name that's not new to seasoned Atari users. They earned their reputation in the 8-bit world by producing excellent games and simulations. Now, they've finally come around to producing software for the ST. One of the best Chess programs around for any computer is Chessmaster 2000. Winner of the 1986 U.S. Open Personal Computer Chess Championship, Chessmaster 2000 is based upon the algorithm that was rated at 2,018 by the U.S. Chess Federation. With over 71,000 opening positions, Chessmaster contains the largest move library ever available on a microcomputer. The game provides twelve levels of play, ranging from "Newcomer" to "Grandmaster." A teaching mode that shows all possible legal moves and a hint mode are provided to help you learn the game. One or two players can play and moves can be retracted as far back as you like. 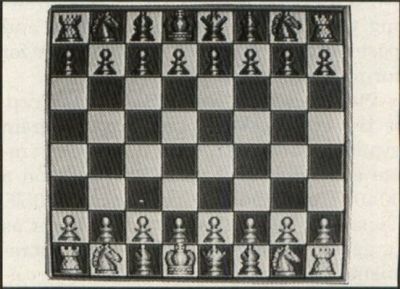 One of the most striking features of the game is the graphic portrayal of the chessboard. It can be viewed in either two- or three-dimensional display. The three-dimensional board can be rotated to see the play from any angle. Additionally, the game allows the players to see all captured pieces and view an on-screen chess clock. Chessmaster 2000 sells for $45. Firebird, makers of the outstanding graphics adventure game, The Pawn, now has a title that is as good, if not better than, their first entry. Golden Path is an animated, illustrated graphic adventure game that goes beyond the Pawn in the quality of its graphic "paintings." The central figure in Golden Path is a white-bearded wise man, who also happens to be a martial arts guru. The player uses the mouse to control this surrogate character through forty-five screens of smooth, life-like animation, while solving his quest. A book of lore is constantly available for examination through an on-screen window that provides clues in developing the wisdom necessary to follow the golden path unerringly. Golden Path retails for $45. The wait is over. Mindscape has finally published Balance of Power for the ST. Balance of Power gives the user the power to make decisions as he plays the role of either the President of the United States or General Secretary of the Soviet Union. The player's goal is twofold: complete eight years in office without initiating a nuclear conflict and accumulate more prestige points than the opposing superpower. To win world prestige, diplomatic tools such as military aid, covert destabilization, treaties, military advisors and troops are available to influence friendly and unfriendly nations. Written by once-Atari game designer Chris Crawford, Balance of Power has received critical acclaim from the press and thousands of Macintosh and IBM PC users. 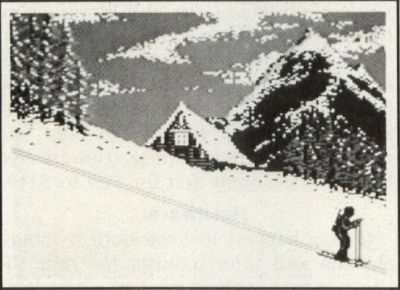 You'll recall that Crawford's earlier work for the Atari 8-bit, Eastern Front, was also a tour de force in its time. Balance of Power retails for $50. Mindscape has another dynamite game that was the first of the CinemaWare series of games to be developed for the ST. Called S.D.I. (Strategic Defense Initiative), it's a science fiction adventure involving a young, beautiful Russian cosmonaut and a handsome American scientist in the midst of a global war of the super powers. Mindscape calls it a story and a flight simulator rolled into one. Over twenty-five screens accompany the story line, requiring two disks for the entire game. The game has a movie-oriented theme and is played in real-time, making it—for the most part—a decision-making game of strategy. S.D.I. retails for $50. If you enjoy a quality shoot-'em-up, you'll probably like Goldrunner from MichTron. It's a fast arcade-style game, similar to Galaxian, except the fighter isn't stationary. The entire playfield scrolls vertically, both forward and backward, and you can fire in the direction you're traveling in. The game may be controlled by either a mouse, joystick or keyboard; there's no need to select which one you want to use, since all are active at once. I especially like the opening title which says: "If it moves, shoot it. If it doesn't move, shoot it." That's as good a description of the game as I could give. Goldrunner lists for $25. —GATO from Spectrum Holobyte is a one-player submarine simulation that challenges you with a series of World War II missions. The missions range from search-and-rescue to convoy support to specified targets. Ten different levels of difficulty are provided and the use of either mouse or keyboard control makes the game easy to play. GATO is an entertaining simulation and the best of its kind for the ST. Retail price is $40. — MicroLeague Baseball is a computer simulation of major league baseball that uses your managerial abilities, together with the actual statistics of real players from twenty-five teams. One or two players can play and each can choose how the particular batter will hit and run, and how the defense will pitch and field the ball. You can also make personnel changes (i.e., relief pitchers, pinch hitters and pinch runners). MicroLeague Baseball is neither an arcade game or a statistical simulation, but a graphic-oriented baseball game in which you, the manager, make decisions and see them carried out on the field. If you love baseball, you'll definitely enjoy MicroLeague Baseball from MicroLeague Sports Association. Retail price is $50. Winter Games has been very popular on a host of computers and now comes to the ST. Seven true-to-life sporting events, from bobsledding to ski jumping to figure skating, challenge the user. You'll need skill and stamina to succeed. The Biathlon and four other events are also included. An opening ceremony—complete with national anthems—greets up to eight players. World Games is a continuation of Epyx's "Game" series in which you can compete with up to eight players in eight events. Cliff diving, sumo wrestling, barrel jumping, bull riding, weight lifting, giant slalom, poll vaulting and a hop, skip and jump contest should keep you and your friends entertained for hours on end. Both Winter Games and World Games sell for $35. 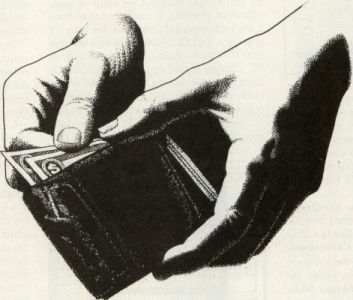 Infocom ranks as the undisputed leader in text adventure games. Their entire catalog of several dozen titles is available for the ST, in many categories like science fiction, fantasy and adventure. Each title is labeled with one of the following grades: Introductory, Standard, Advanced or Expert. The grades are based on the difficulty level of the game—although all titles require some degree of puzzle solving—and are written in the spirit of fun. My long-time favorite Infocom text adventure has been Planetfall because it contains a combination of adventure, science fiction and humor. 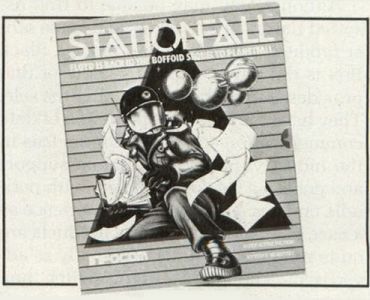 The sequel, called Stationfall, is equally challenging and fun. A good choice for the novice text adventurer might be Seastalker. It offers a good challenge and—like all Infocom games—is a quality product. Another title I like is Trinity. A cross between the Twilight Zone and Alice in Wonderland, Trinity leads you into an alternate universe where magic and physics coexist, and every atomic explosion that has ever occurred is inexplicably connected. The chilling climax of the story takes place in the New Mexico desert on July 16, 1945. You arrive minutes before the most fateful experiment of all time: the world's first atomic explosion, code named Trinity. Infocom recently released a title in a strictly humorous vain with a different twist. Called interactive short stories, or—more specifically, Nord and Bert Couldn't Make Head Nor Tail of It, this is a game where nothing is quite as it seems. Eight short stories are provided, each involving a different type of wordplay. You'll be challenged to come up with the clichés, spoonerisms and other verbal trickeries needed to complete the puzzles. Fortunately, Infocom offers built-in hints (for the first time) that can be called upon when the rough get going. Every ST owner should have at least one Infocom game in their software library. List prices of these text adventures range from $40 to $60 each. There are a number of accessories for the ST user that seem frivolous. On the other hand, some serve quite a useful function and are worth their price. One such product is called The Last Stand from O&R International. Billed as the "complete desktop computer center," this is an attractive two-level shelf made out of plastic that can support two disk drives and a monitor. The ST is stored under the bottom shelf when not in use and can easily slide forward for use. Your drives sit on the bottom shelf with room to spare for disks or other computer paraphernalia such as a modem or hard disk drive. The top shelf supports your monitor, and all cabling is neatly kept behind the unit. The Last Stand retails for $45. Black Box Corp. has dozens and dozens of products to make your computer life easier. The majority of these products are hardware switch boxes, such as ABC-25 Switch, a switch that allows two computers to talk to the same printer. Another useful switch model allows two computers to communicate through the same modem. Although you may be able to find assorted flavors of A-B boxes and some other products for a little less money, Black Box is the only company I know of that provides support before and after the sale. They have the most complete line of data communication and computer devices in the industry, provide telephone support and publish a catalog, complete with periodic updates. From years of experience as a user, I can tell you that the products are quite reliable and function exactly as advertised. The Mercedes of switch box companies is Black Box Corporation of Pittsburgh. You may not know it, but your computer and peripheral equipment are at the mercy of the power company and Mother Nature. The power company can supply you with voltage that's either too high or too low. Temporary power surges or spikes can seriously damage your hardware, as can undervoltage which occurs during a brownout. Mother Nature likes to throw lightning storms across the countryside. Although telephone and power lines are designed to prevent lightning from traveling along the wires and into your home, it occasionally happens. To get protection from these potential catastrophes you need a surge suppresser, which is a device that's inserted between the AC outlet and your computer. By limiting extra high or extra low voltages, it protects your computer's electronic components from being "fried." These products come in a variety of shapes and sizes, but one company that offers a complete line of products that have been tested to work as advertised is Panamax. Panamax makes a variety of different products that include power line conditioning, telephone line protection, multiple outlet strips and brownout (under-voltage) protection. In addition, there's a lighted on/off toggle switch, reset button, circuit breaker, replaceable fuse and separate surge and brownout indicator lights. Some models have circuit breakers, alarms and other features to help you manage your power protection needs. Panamax's models sell for $69 to $149. If you happen to have both a monochrome and color monitor for your ST, you can make things easy on yourself by getting Monitor Master by Practical Solutions. Monitor Master allows you to connect a monochrome and RGB monitor to your ST, and includes separate audio and composite video output jacks. Changing from monochrome to color, or vice versa, is as easy as pressing a button on the unit. Further, the composite video output is great for providing a video signal to a VCR. Although the composite signal is only available on 520s and 1040s with an RF modulator, the audio is available on all machines. Monitor Master sells for $50. 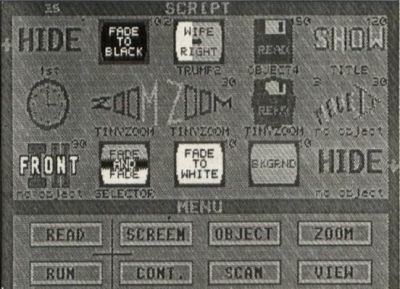 Digital Vision was the first to develop and market a video digitizer for the 8-bit. 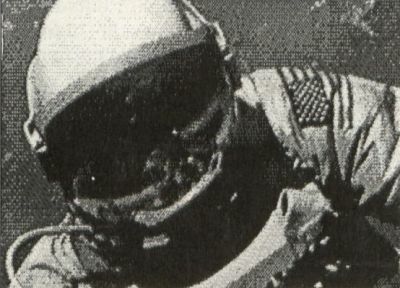 Although it could only digitize black-and-white images, it was seen as a unique and low cost means of capturing graphic images. Now, Digital Vision has a video digitizer for the ST called ComputerEyes. This system includes both hardware and software and supports all of the graphic capabilities of the ST. The hardware interfaces easily to any source of standard NTSC color or black-and-white composite video. These sources include video cameras, VCRs, video laserdiscs and other computers. All capture and display functions are mouse controlled under GEM and images may be captured in either monochrome or full color. The ComputerEyes software performs automatic calibration of brightness, contrast and color balance. Once the image has been captured, brightness, color content and contrast can be easily adjusted to suit your needs. The images saved by ComputerEyes are compatible with Neo-Chrome, DEGAS, DEGAS Elite and other graphic programs. ComputerEyes retails for $250. If you've been waiting for the quintessential desktop accessory cartridge for the ST, DeskCart! from Quantum Microsystems Inc. (QMI) may end your search. Deskcart! contains a battery-backed-up real-time clock and a plethora of desktop accessories on one cartridge, all of which consumes a meager 75K of precious RAM. The fourteen accessory programs include: a calendar that runs to the year 2040; an appointment book with alarm; a notebook which is really a mini-word processor that allows you to create, edit and save multiple 12-page notebook files; a card file that allows nine lines of data; a very good calculator; a typewriter that lets you use the ST to address envelopes or print other short pieces; an address book; a VT-52 terminal emulator; keyboard macros; a RAMdisk of any size on any drive; disk utility functions; a print spooler; a control panel similar to the ST's control panel; a screen dump; and memory test. DeskCart! retails for $100. The best hard disk for the ST has been—and still is—the Supra 20-Megabyte hard disk. I've used the 20-meg drive for almost a year and can still says it's an excellent piece of hardware. The 20-mega-byte drive retails for $699 and can be purchased direct from Supra or from retailers. All Supra ST hard disks connect to the ST's DMA port and come with a boot program that allows the ST to boot directly from the hard disk. Under our miscellaneous category we thought it appropriate to include Atari user group memberships. There are many fine groups around the country and their memberships average about $20. These groups have monthly meetings, publish newsletters and often have libraries of public domain software. User groups always have knowledgeable people who are willing to share information. With the new "lean" Atari, user groups often provide a good source of Atari-specific information. Both beginning and expert ST users may also want to take a look at the books and magazines now available. The predominant book publisher in the ST field is Abacus Books and they have more than a dozen different titles that will fill just about every need. I'll just mention a few that may be of interest. Atari ST Graphics and Sound is a book that teaches you how to create graphics and use the built-in sound facilities of the ST. Examples are written in Basic, C, Logo and Modula 2, so there's something for everyone. ST Tricks and Tips covers such topics as: using GEM from BASIC, combining BASIC and machine language, creating a RAMdisk and print spooler, and automatically starting TOS applications. If you would like to learn more about programming, this book will be a great help through the use of sample programs and tips for both the new and expert programmer. ST Internals is a well organized, useful compilation of technical ST information. A clear description is given for such ST "parts" as the mouse, keyboard, 68000 processor, custom chips, I/O ports (RS-232, parallel, cartridge, DMA, floppy disk, MIDI and video) and operating system. In addition, this volume contains information about GEMDOS, graphics and the BIOS (Basic Input/Output System). ST Disk Drives—Inside and Out covers topics like files, file structures and data management. 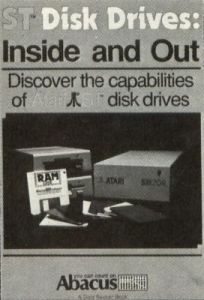 The book also discusses all aspects of floppy, hard and RAMdisks as they relate specifically to the ST. The book also lets you explore ST disk drives from a programming or technical perspective. There are a few programming books that are useful for the person who wants to learn a new language. Atari Basic Training Guide is a functional and educational introduction to ST Basic. From problem analysis to BASIC commands to algorithms, the book provides the fundamentals of programming in an easy to understand format. ST BASIC to C is an ideal book if you already know BASIC, but want to learn how to program in C. This book compares BASIC programs and their C equivalents, so you can make the transition easily and rapidly. ST Disk Drives—Inside and Out. Atari ST Machine Language is devoted exclusively to programming the 68000 microprocessor. Starting from scratch, with chapters on microcomputer fundamentals and hardware fundamentals, this book leads the programmer, step by step, into the world of machine language programming. Another Abacus book, ST GEM Programmers Reference, provides detailed information on GEM, with examples written in C and 68000 assembly language. An overview of such topics as VDI, AES, GDOS and GIOS is included. In addition, material on programming in GEM, with explanations on using the editor, C compiler, assembler and linker of the development system, are included. All these books are currently available and sell for $20 each, except Basic Training Guide, which costs $17, and ST Disk Drives, which retails for $25. Everyone needs an extra joystick or two and Epyx has an excellent one for right-handed people. Called the 500XJ Joystick, this stick is made for fast action because it fits your (left) hand so well. The fire button is located right where your trigger finger falls, so you can blast the aliens or select from a menu fast and accurately. The stick has a short throw for more precise control and you can actually hear and feel every move of the stick. If you need a new joystick, you should definitely check out the under $20 500XJ from Epyx. The 500XJ also comes with a 5-year or ten-million-shot warranty. There are several on-line information services available to the ST user. To get started using the vast resources of CompuServe Information Service, the CompuServe Starter Kit is a good value. For $39.95 you receive five free hours of connect time and a thorough manual. CompuServe offers computer and general interest news and information, and the user is also able to electronically correspond with other system users. Another information service is the Atari Users' Group SIG on Delphi. Run by ANALOG Publishing, Delphi is a great way to participate in the world of Atari computing. Delphi is a full-service, online communication and information network. Access charges average as low as 10 cents per minute from most parts of the country and there's no extra charge for high-speed access. The Atari SIG on Delphi provides a host of services and features. You can send and receive messages from and to other Atari users worldwide in the Forum. 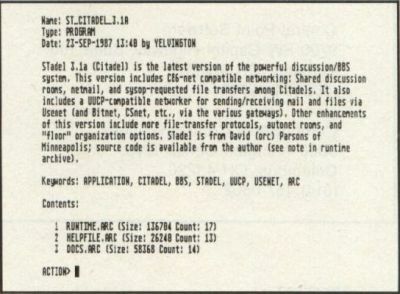 The database area includes thousands of free programs that can be downloaded, including the programs presented each month in ANALOG Computing and ST-Log. The conference feature allows you to meet electronically with other Atari users. In addition, the ANALOG Publishing staff is available on-line to answer your questions and share information. Atari User's Group SIG on Delphi. To use either of these information services you'll need a modem, a device that allows your computer to electronically interact with another computer, via phone lines. There are several good ones to choose from, but one of the best values around is Avatex's 1200-baud modem. It retails for under $130 and is Hayes compatible. An unusual, but useful, product is the X-10 system from X-10 America, Inc. This is a system that's used to remotely turn AC devices on and off, either directly or via a timer. Assorted modules control such things as lights, appliances and other electrical devices by means of commands sent through the AC wiring in your house. A computer peripheral, called the X-10 Powerhouse, attaches to the RS-232 port of your ST and can be programmed to control the various AC devices in your house. The X-10 Powerhouse unit is self-powered, and once programmed, can be disconnected from the computer, thus freeing that port for other uses. The X-10 Powerhouse is available from MichTron for $25. The software needed to control the Powerhouse is called Echo and is also available from MichTron. It lists for $40. Echo is a GEM application, so all inputs are entered via the mouse and any desktop accessories are always available.